Work of relief was speeded in Williamsport as that the town took stock of the damage wrought by the worst flood in history. 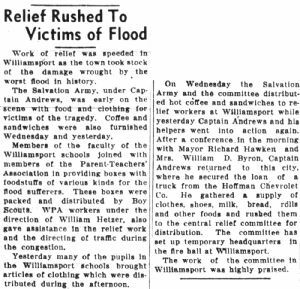 The Salvation Army, under Captain Andrews, was early on the scene with flood and clothing for victims of the tragedy. Coffee and sandwiches were also furnished Wednesday and yesterday. Members of the faculty of the Williamsport schools joined with members of the Parent-Teachers' Association in providing boxes with foodstuffs of various kinds for the flood sufferers. These boxes were packed and distributed by Boy Scouts. WPA workers under the direction of William Hetzer also gave assistance in the relief work and the directing of traffic during the congestion. Yesterday many of the pupils in the Williamsport schools brought articles of clothing which were distributed during the afternoon. On Wednesday the Salvation Army and the committee distributed hot coffee and sandwiches to relief workers at Williamsport while yesterday Captain Andrews and his helpers went into action again. After a conference in the morning with Mayor Richard Hawken and Mrs. William D. Byron, Captain Andrews returned to this city, where he secured the loan of a truck from the Hoffman Chevrolet Co. He gathered a supply of clothes, shoes, milk, bread, rolls and other foods and rushed them to the central relief committee for distribution. The committee has set up temporary headquarters in the fire hall at Williamsport. The work of the committee in Williamsport was highly praised.